He was just over sixteen when he accompanied his friends who played for Les Corbeaux to their matches. Deep down, Moise KATUMBI would have liked to take the field with them. He would have loved to be a great footballer and, if truth be told, he wasn’t bad at all when he played matches with his pals from the housing estate or when he trained with the younger Corbeaux. As a kid, he was happy collecting the Mazembe balls after training and after matches, when he could greet and talk to the star players. In a stroke of fate, a broken leg shattered the dreams of the teenager who already followed Mazembe to matches, in the shadow of its chairman, his older brother Raphaël. Let’s get back to Les Corbeaux club... When the players’ transport needed to be paid for, the chairman disappeared, the deputy chairman was nowhere to be found and the players had only their friend, Moïse, with them to save the situation. « You feed us, you pay our transport and you found us a room as well. We’ve wasted enough time, take over as chairman ! » they said after two years to the person who took care of all the problems. « Ok, but I’ll be your deputy chairman, not to rush things » he answered, a little apprehensive at the weight of responsibility falling on his shoulders. What Moïse did not know at the time was that fate would strike a second time. Indeed, two months later, the chairman who worked a civil servant, was transferred to Kinshasa and left the post open. It is easy to guess what happened next… In less than four months, between March and May 1983, Moïse KATUMBI became chairman for the first time of a club that he managed for seven years, taking them to the 1st division in his first season. Raised to the top level, Les Corbeaux held their own against the best and even won the provincial champions’ title in 1991. That same year, Mazembe had problems when a majority of the Kasaian players left to go to Kinshasa, South Africa or even to Korea or China. Big brother Raphaël was no longer there and to “re-feather” the team, Mazembe merged with Les Corbeaux..
Moïse Katumbi was named a member of this new club’s committee, but was not present at their meetings. Exiled to Zambia, he still followed the sports news from Lubumbashi with interest. What he learned broke his heart: football in Katanga was slowly on the decline and the stadiums were deserted. In Lubumbashi, a Mazembe-Lupopo derby only attracted a mere thousand spectators. In 1995, he went to a match between Mazembe and Lubumbashi Sports where only 300 people made the trip to Kenya. It was a makeshift era for a club in a complete slump that did not even play in the Africa Cup any more. During the elections that were held in 1997 to form the Mazembe Sports Committee, Célestin KAMBA prepared a coup on his own in the shadows. A former Mazembe midfielder or right winger from when the Lubumbashi team played in four successive African Champion Clubs Cups in the 60s, he put Moise forward as a candidate without even asking him. Elected as chairman when he was still exiled in Zambia, Moïse took over a club that was starting from scratch all over again and that he wanted to get into the Africa Cup. He failed in 1998 and the next year (99) with Mazembe losing 5-0 on Algerian team JSK’s ground in… tartan, a concrete-hard playground where a Kabyle player actually died shortly afterwards. The chairman mustered his courage and worked tirelessly to send money to the club and recruit players… by telephone. For political reasons, he was forbidden to set foot in Katanga and journalists did not even dare say his name, but he was Congo champion and winner of the national Cup in 2000. Mazembe got to the quarter finals of the Africa Cup in 2001 then to the semi-finals in 2002. EIn July 2003, Moïse was at last allowed to come back to his country and get started on a huge task. He wanted to re-launch football in Katanga. On receiving an ovation In the Kenya stadium, he told the people that he had never betrayed the province or the country. « Brothers and sisters, I am going to fight for you and bring a cup back to Lubumbashi… », he stated in a moving promise with tears in his eyes. He just asked for a little patience. Moïse KATUMBI kept his word with extraordinary brilliance. A man of faith, a visionary and a relentless worker, he made sure that football benefited from his professional success as no-one in the Congo had ever done before. He was everywhere, gave 700 000 US dollars for the renovation of the Kenya stadium that had been closed until then by the CAF. He reversed the transfer tendency : it was no longer Katangese players that were going to Kinshasa, but players from the capital that he brought to L’shi. By increasing the transfer fees from 500 to 20,000 dollars, he provided the clubs that were selling with significant means. By multiplying his protégés’ salaries by 2, then by 5, he persuaded his players to stay! He charged along like a cyclone that nothing could resist… and he forced the managers of rival teams like Lupopo and others to find the means to try and compete with Les Corbeaux. In 2004, Mazembe was knocked out in the final 8 of the African Champions Cup then in the quarter finals of the CAF Cup. With success taking its time, some supporters became impatient and moaned: « For sure, Katumbi is putting the money in, but he isn’t lucky and we’ll never win the Cup with him ». Some did not want to understand that the team was still young and inexperienced. Mputu was only 17 and his team mates are talented but lack experience. Some people therefore wanted to push him to recruit older players. Hurt by this lack of confidence from a tiny group of people who weren’t thinking clearly, Moïse refused, went to Mwanke stadium and threatened the public with his resignation. The warning was serious and some fans even went so far as to lie down in front of the wheels of his jeep to make him give up his idea of leaving and force him to continue his work. 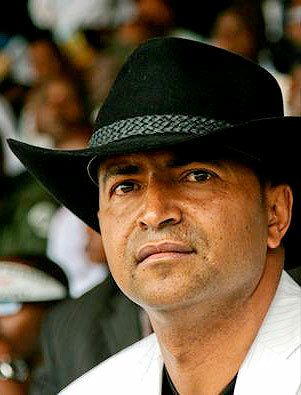 Driven by the fire of passion, Moïse KATUMBI led, animated, financed and innovated, always looking for ways forward. In the giant’s shadow, Carine, his wife, a mad keen football fan, encouraged him and showed her concern, convinced that he was going to achieve his goal. « I was lucky to have a woman who understands football and men. She has always encouraged me, persuading me that we would do it…» he confides. In 2006, the team was disqualified from the Africa Cup for a problem caused by the FECOFA (Congolese Federation Football Association) and in 2007 it lost against FAR de Rabat in the final eight. Things fell into place in 2008, when Les Corbeaux flew off for a European tour. They were headed to Belgium (Charleroi) and Spain (Seville), but especially to London, invited by Arsenal. They spent a week with the Gunners and had a huge confidence boost in Colney’s icy and windy winter. « When a guy like Arsène Wenger invites us little Africans to stay with him, it gets rid of your last hang-ups. And his encouragement had an incredibly stimulating effect. Arsène and the Arsenal people will always be welcome in Katanga…» says the chairman gratefully. First African club in a world competition final : a historic moment ! 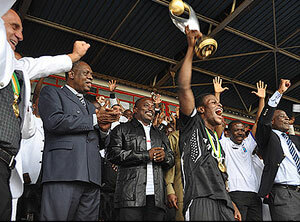 Over the two next years (2009 and 2010), the team reached maturity and Mazembe settled at the top of the African table. Two new golden stars were sewn onto the Katanga jerseys, with two African Super Cups along with them. The cherry on the cake was a World Vice-Champions title won in December 2010 by Coach Lamine NDIAYE’s men in Abu Dhabi, giving them worldwide recognition. Mazembe was the first African club to get to the finals of the Clubs’ World Cup. 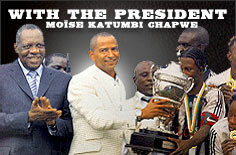 When he took over the management of the club, the players only had one set of kit, which they often had to put on still damp because it did not have time to dry… Moïse KATUMBI changed everything, everywhere: infrastructures (Kenya stadium completely renovated with synthetic turf, a new stadium under construction), legal standing (changed to a private limited liability company) and a much bigger budget, with the players’ salaries and bonuses brought up to European level, etc. TP Mazembe and Almighty Moïse still have a few pages of history to write.